This Southern inspiration contains just about everything a homeowner could want in a single floor plan. 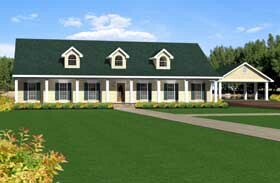 The plan spreads from two welcoming porches to four big bedrooms and an enormous living area comprised of large great room, kitchen and dining room. The Kitchen will be the HEART of this home. Perfect for anyone that loves to cook. The traffic patterns encourage family togetherness but allow necessary privacy. Visitors enter into the foyer for privacy. A Powder Room is located off the Foyer for guests. 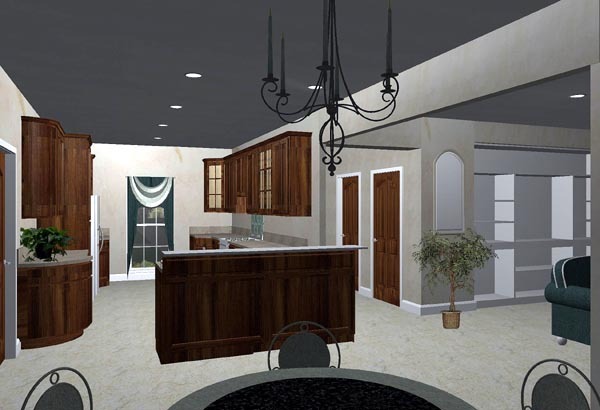 The Large Great Room contains a gas fireplace and gives way to a large kitchen with a snack bar. The dining area is perfect for large families and gatherings. The master suite is situated for privacy. This room is HUGE - as large as MOST two car garages! It features a walk-in closet and spa style bath. This bath is a owners retreat with dual sinks, corner whirlpool tub, seperate shower, toilet compartment and seperate linen storage. Many homeowners will find it appealing that the master suite is opposite from other bedroom spaces. Bedrooms 2 and 3 share a Jack and Jill bath arrangement and each has their own walk-in closet. Bedroom 4 can be a home office or guest room with access to a bath close by.